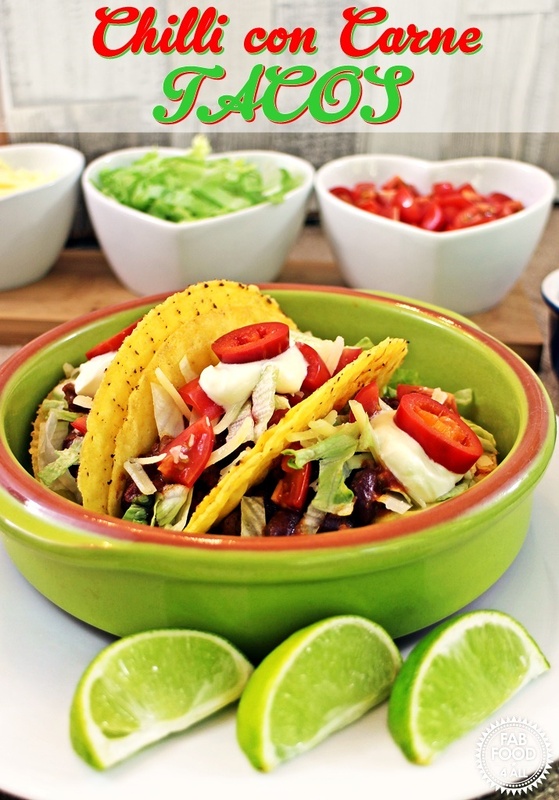 You are here: Home / Beef / Chilli con Carne Tacos – a quick & tasty family meal! 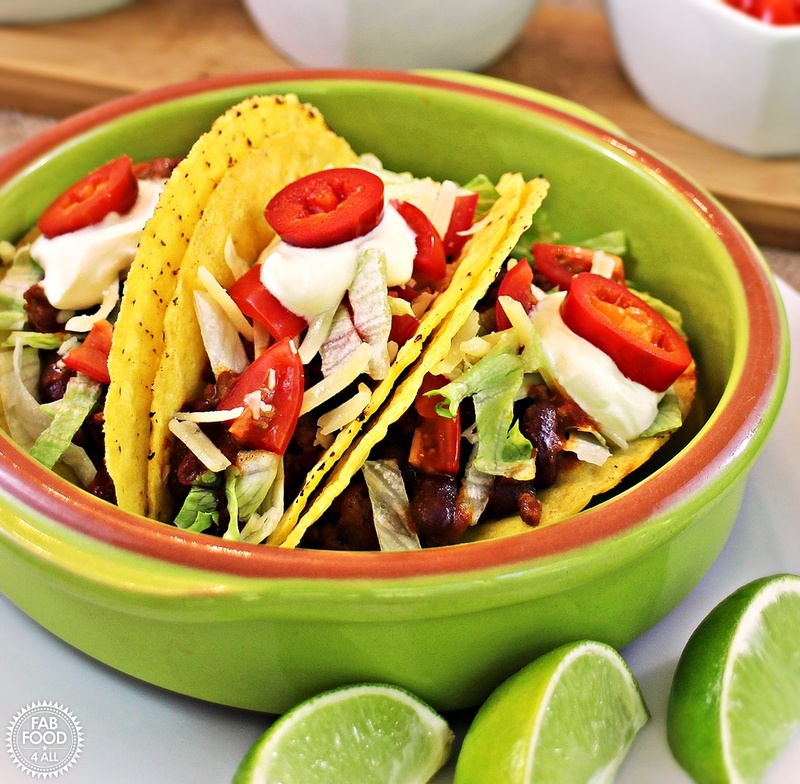 Chilli con Carne Tacos – a quick & tasty family meal! I don’t remember exactly when I had my first Chilli con Carne but I’m pretty sure it was made using Schwartz Recipe Mix. My mum cooked most of our meals from scratch but I remember a friend of hers recommending the Schwartz Chilli con Carne Recipe Mix and it became a firm favourite served with rice. So one day when my mum had to go off to Denmark and I found myself having to cook for my dad and then new boyfriend, I decided to make our favourite fool proof Chilli con Carne. No doubt we would have been going out for the evening so I chose to do something quick and easy. There was however one snag, after trawling several supermarkets there was no fresh beef mince to be found so I found myself buying frozen mince, this was truly uncharted territory! Sadly it made the worst Chilli con Carne ever in both flavour and texture, not really the best way to impress your new boyfriend. Frozen mince in the 80’s was nothing like the frozen mince you can get today which is really rather good. Luckily new boyfriend saw past my culinary disaster and went on to become my hubby (just as well I wasn’t on Dinner Dates)! I had forgotten all about the Chilli con Carne Recipe Mix until Schwartz got in contact to ask me about a food story and my favourite dish. My own family all love Chilli con Carne and our favourite way to have it is in tacos with salad, grated Cheddar, sour cream and jalepenos! I usually divide the Chilli between 4 bowls which I serve on a plate along with the tacos and then everyone assembles their own taco from the bowls of garnishes on the table. I like to add a few jalepenos to my Chillies so did this with the Schwartz Recipe Mix but they also do a Hot Chilli con Carne for people who like a bit of heat. My family loved this meal and I love that it is just so quick to put together (it was just as good as I remember it)! When you don’t want to compromise of taste and are pushed for time a recipe mix like this can be a huge helping hand! NB: Recipe commissioned by Schwartz. 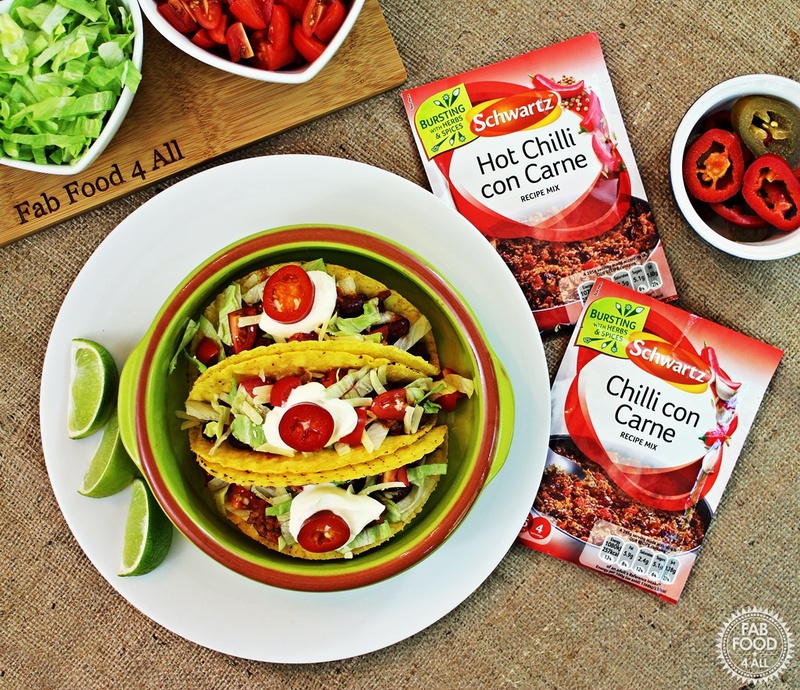 Chilli con Carne Tacos are a fabulous quick and tasty meal using Scwartz Recipe Mix. Perfect for a midweek family meal! Heat the oil in a deep frying pan/wok. Fry the mince until browned (about 5 minutes). Add the Schwartz Chilli con Carne Recipe Mix contents, tomatoes, kidney beans, jalapenos and water. Lower heat to a simmer, cover and cook gently for 15 – 20 minutes, stirring occasionally. Towards the end of cooking heat up the taco shells according to their instructions. Place all the prepared garnishes in bowls ready to serve at the table. Once ready divide the Chilli con Carne between 4 bowls and place on serving plates along with 3 tacos each. 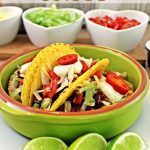 Allow your guests to assemble their own tacos from the Chilli and garnishes. Previous Post: « Creamy Italian Salad Dressing – great with Pizza!